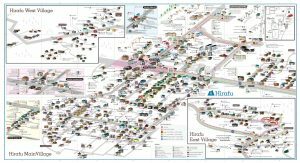 Hirafu Village is the main ski village in Niseko which is located on the base of Mt Niseko-Annupuri and the main streets are very steep. It is not your traditional ski-in ski-out resort town. However, with the efficient Free Hirafu Shuttle services run throughout the village getting around is quick and easy. The Free Hirafu Shuttles are complimented by the Ramat Niseko Private Shuttle service to ensure guests’ holiday needs are met. A complimentary shuttle bus is run by Ramat Niseko to help accommodate your needs. Our friendly staff will pick you up on arrival from either the Welcome Centre or Kutchan Train Station and take you to the lodge. A nightly shuttle into town is also available for guests to explore the array of restaurants or nightlife that Niseko has to offer. Other services provided where possible include trips to Kutchan for food supplies and drop offs to ski lifts and the occasional daytrips to other ski resorts. Also take advantage of Ramat Niseko’s First Tracks Shuttle and be the first on the slopes every day. The bus leaves every morning at 8.10am packed full of keen guest that are eager for fresh tracks. Ramat and Snowgum Lodge are only 15-20 minutes walking distance from the centre of the village. On a nice day it is a pleasant journey to walk into the village passing little cottages and cafés you may have never noticed before. Why not take a stroll next time you’re heading into the village. The free Grand Hirafu shuttle operates between 8.30am – 9.00pm every day with the last service leaving Seico Mart at 9.15pm. There are buses approximately every 20-25 mins with the closest bus stop (no. 24 – yellow line) in easy walking distance and less than 150m from the lodge. This service will only take a few minutes to get you into the centre of the village where you can access the lifts, convenient stores, restaurants and bars. The shuttle operates from the welcome centre to Hirafu Gondola and also covers the Izumikyo (Hirafu East Village) area. 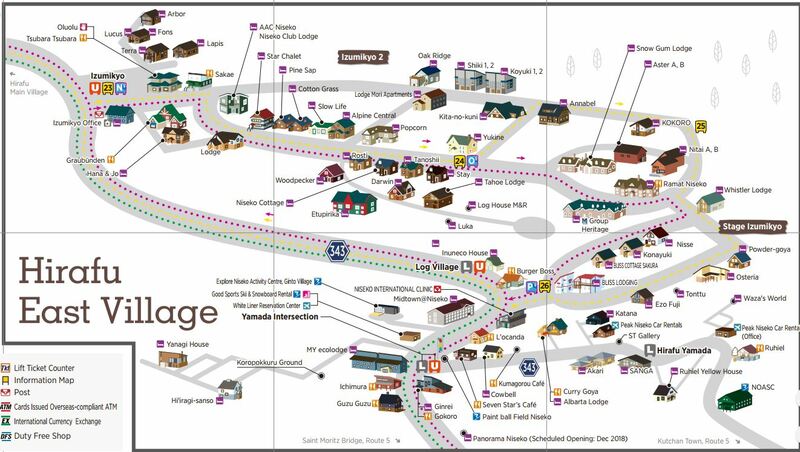 Please see the below village map for shuttle route and bus stop locations (Ramat Niseko is in cell H4). A free bus service for all those who hold an All Mountain Lift Pass is available between the main ski resorts of Annupuri, Niseko Village and Grand Hirafu in the ski season, operating between 08.30 and 21.00. Without a Niseko United lift pass the cost is between 200-500yen, depending on the distance travelled. Running four times a day between JR Niseko Station, Niseko Village (not Hirafu Village the main ski village), Higashiyama area and Annupuri this service cost 100yen. Operating between 18.00 and 23.20 during the ski season, this bus provides travel from Hirafu Village and Kutchan town in a 10 minute trip and is within walking distance of the lodge.